1. Brexit crunch: The Bank of England held interest rates at record lows on Thursday. But it warned of continued risks from the "exceptional circumstances" that have resulted from the Brexit vote. "There remain considerable risks to the outlook, which include the response of households, businesses and financial markets to developments related to the process of EU withdrawal," the bank said in a statement. The pound gained 0.8% against the dollar after the announcement. The central bank is in a bind. Inflation is racing ahead and unemployment levels are at record lows. But prices are rising much faster than wages, and the economy is slowing, hurt by anxiety among businesses and consumers over the impact of Brexit. John Lewis, one of the country's leading department store chains, said Thursday its first half profits halved because of weaker consumer demand and the fall in the value of the pound. 2. Tesla's new truck: Tesla is set to unveil its new semi-truck next month, CEO Elon Musk said. The new Tesla Semi will do a test ride on October 26. "Worth seeing this beast in person," Musk tweeted late Wednesday. "It's unreal." The launch date is a bit later than Musk had suggested earlier this year. In April, he said Tesla (TSLA), which has missed self-imposed deadlines in the past, would reveal the battery-powered truck in September. 3. Trump blocks China tech deal: President Trump on Wednesday stopped the takeover of American chip maker Lattice Semiconductors by a private equity firm with ties to China. The deal was blocked over national security concerns, including "the potential transfer of intellectual property." The Trump administration launched an investigation last month into whether China is unfairly getting hold of American technology and intellectual property. 4. 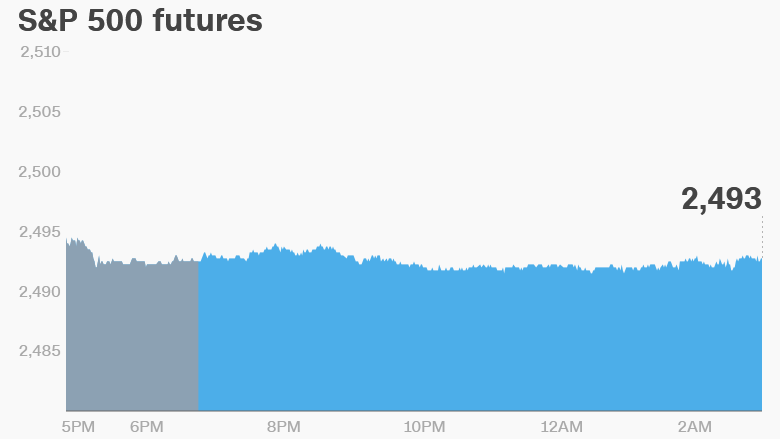 Global market overview: U.S. stock futures were edging lower early on Thursday. European markets opened mostly lower, while Asian markets ended the session mixed. The Dow Jones industrial average closed 0.2% higher on Wednesday, while the S&P 500 and the Nasdaq were both up 0.1%. 5. Stock market movers: Equifax (EFX) was down 2% in extended trading, after slumping 14.6% on Wednesday. The company is facing mounting criticism for the way it has handled a huge data breach, which compromised the personal information of as many as 143 million Americans. 6. Earnings and economics: Oracle (ORCL) is set to release its latest earnings report after the close on Thursday. The Bureau of Labor Statistics is set release its August inflation report at 8:30 a.m. ET.